Pho Saigon Noodle House births a baby brother in Murray. I recall being cautiously excited when Pho Saigon Noodle House (2222 E. 3500 South) opened during the summer of 2013 near the Maverick Center, after an eight-year run at a previous West Valley City location. There weren’t near as many pho emporiums around town back then as there are today, and I hungrily welcomed each new addition. I hadn’t been back in quite some time, so when I learned of its new offspring in Murray, I was eager to visit Pho Saigon Noodle House 2, which opened for business in September 2016. It’s been a hit almost from Day 1. Stepping into the new eatery—which is located adjacent to a Subway and an almost-open sushi restaurant on the ground floor of the Home2 Suites by Hilton—it’s the color that hits you first. The walls are painted a vibrant green, and huge photographs depicting scenes from Vietnam decorate them. There are tables and booths, as well as a long counter that’s perfect for slurping pho solo. My first thought was how clean, colorful and airy the restaurant is. I’m pretty sure you could eat off the floor—it’s that spotless. I’ve always been quickly seated and greeted with friendly hellos whenever I’ve visited. However, you might have to ask for a short time-out. Servers are on-the-spot and rapidly ready to take your order, but in our case, we needed some time to digest (so to speak) the mouth-watering menu. It’s an extensive one, and requires thought, hard choices and, in some cases, welcome guidance. There are 16 pho options, for example, and each one comes in small or large size ($6.65; $7.75), plus add-ons such as extra meat, extra noodles, etc. And that only accounts for about one-eighth of the menu. So, I recommend ordering an appetizer or two to nosh on while you make more important decisions. Spring rolls are always a good place to start in Vietnamese restaurants; they are relatively simple and straightforward and—to borrow from the late Johnnie Cochran—if the roll ain’t right, you must take flight. Well, the spring rolls here ($3.75) are excellent: two opaque rice paper wraps encasing steamed shrimp, roasted pork, rice vermicelli noodles, lettuce and bean sprouts served with a sweet and salty dipping sauce of soy, fish sauce, sugar, shredded carrot, onion and chopped peanuts. Another interesting starter—although it’s not listed as such—is the house specialty báhn xèo ($7.75). Also called “happy pancakes,” the plate consists of a large serving of two savory, omelet-like crêpes made from rice flour and filled with bean sprouts, roasted pork slices, thin-sliced onion and shrimp. Xèo refers to the sizzling sound the crêpes make when the rice flour batter hits a hot pan. Alongside is a big plate of garnishes like lettuce, Thai basil and a spicy coriander-tasting Vietnamese herb called rau răm. Overall, though, the bánh xèo is a bit bland and begs for hot chile oil or dipping sauce, which are provided. I heartily recommend bánh bột chiên ($6.25), one of my favorite appetizers. I was expecting something cake-like in appearance and texture from a dish described on the menu as “pan-fried rice cake.” What arrived was small, bite-size cubes of lightly charred and crisp rice squares stir-fried with egg and topped with minced scallion and green papaya. Sweet Saigon soy sauce came alongside. I’m guessing that this dish must begin as sort of a rice pudding, wherein the rice is allowed to cool and set, then cut into small pieces for frying. Whatever the case, it’s delicious. Now for some big fun: Prices at Pho Saigon Noodle House 2 are so ridiculously low, how can you not order the most expensive item on the menu? That would be the nướng vĩ, which is translated as “grilling at the table.” For $19.95, you’ll get a DIY setup that can feed two to four people, depending on how many appetizers and such you’ve enjoyed beforehand. Your server will set up a portable gas grill at your table and turn it on. The rest, is up to you. 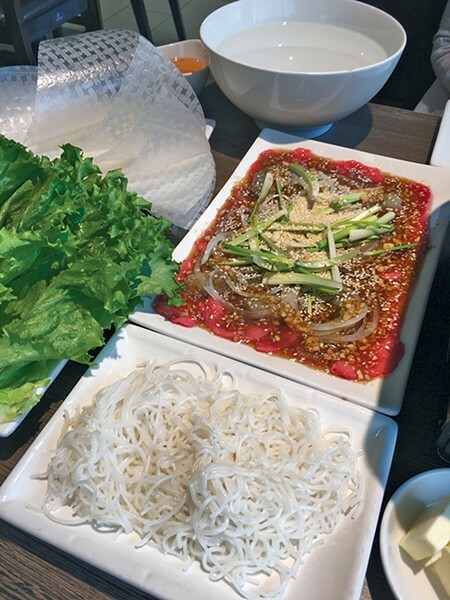 The table is provided with warm rice noodles, rice paper wraps (which are dipped in water to soften), a big platter with basil, cilantro, lettuce, carrots, cucumber and bean sprouts, a plate of thin-sliced raw beef and shrimp marinated in a sweet (almost teriyaki-tasting) soy sauce with Vietnamese spices and slivers of white and green onion, all topped with white sesame seeds. The pats of butter supplied are for lubricating the hot grill. We quickly got the hang of buttering the grill and sautéeing the beef and shrimp, although a couple of times I managed to nearly knock the hot grill off of its base, which caused me to wonder about the wisdom of allowing patrons to grill food at their own tables. At least customers can’t send dishes back for being under- or over-cooked. Overall, our nướng vĩ experience was fun and delicious, albeit a bit messy. Other satisfying items include vegetarian tofu-filled rice paper rolls called gỏi cuốn chay ($3.75), egg noodle soup with char-siu pork ($6.65), and the house special stir-fried tofu with veggies and steamed rice ($7.95). Of course, you want to know about the pho. Well, it’s so good here that you’ll run the risk of always ordering pho and never getting around to all the other delicious menu options. But, that’s a happy problem to have. Though it’s perhaps a skosh saltier than most, the pho at Pho Saigon Noodle House 2 is as aromatic and palate-pleasing as you’ll find in Utah. Go pho it.